Today my baby boy, George, turns six years old. Sometimes it's hard for me to believe he was ever our little pug puppy! 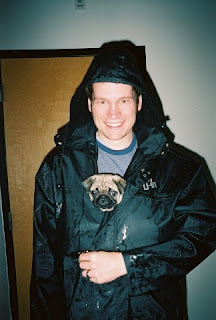 George was just about 10 weeks old when we picked him up over Valentine's Day weekend in 2005. Chapin and I didn't have much experience as dog owners, but I think we were fast learners. George did like to get into trouble, though. He was quite a chewer, and ruined a pair of glasses I left on an end table, as well as that maroon rug you see in the picture. 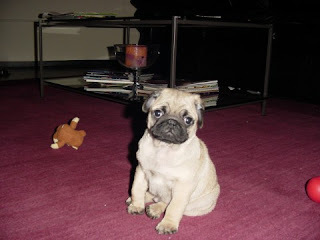 We also could not let him near toilet paper or Snuggle, because he would rip them up to shreds! Today George is a pretty mellow guy. He enjoys morning cuddling with his daddy while his momma works out, and especially loves the weekends when he can spend lots of time with us. Chapin actually remarked this morning that he probably kisses George more than me, and I said I probably told George I loved him more than anyone else. Can you tell we love our boy?